Desserterie. Patisserie. Bistro. Minus 18 Degrees in Baner is all this and more. What catches curious eyes is the view of the top storey of Minus 18 Degrees of busy chefs with their gloved hands working on dish after dish. This 45-seater bistro is the vibrant new kid on the block. 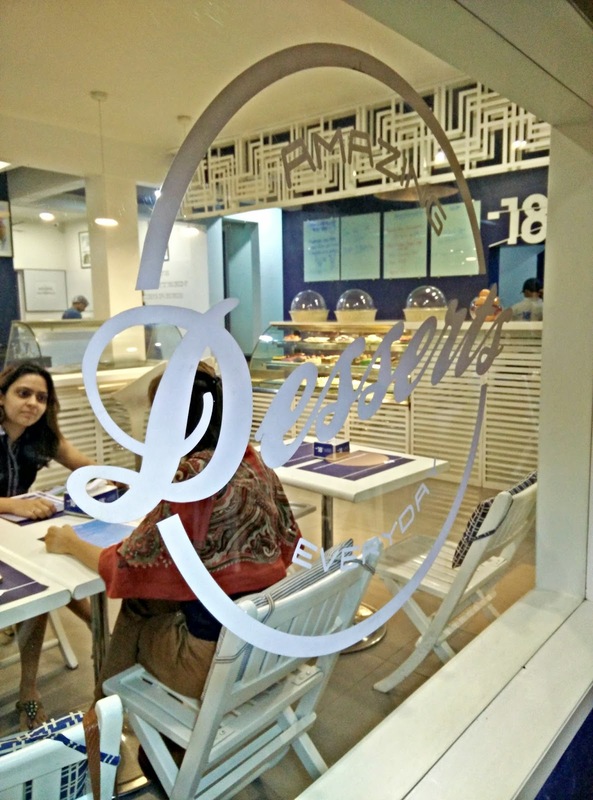 Stark navy blue and white walls could have made the place look clinical, but the smart interior designer has blended it together with subtle touches of teal - on the upholstery, the menu and the picture frames on the wall. With the chosen color palette, Minus 18 Degrees could have been the perfect naval office canteen. There is alfresco seating but you really want to sit where all the action is happening – indoors. Push open the door and you are greeted with a sweet aroma. It’s a bustling scene inside - young waiters energetically attending tables, people waiting by the counter to collect their food orders, diners indulging in conversation and hearty laughter. The operational flow is orchestrated by Kimico Mehta. An ex-Baskin Robbins franchise owner, Kimi is today a proud owner of this bistro and you’ll find her chatting with her patrons and even taking orders. Asked about the bistro name and Kimi explains as an ex-franchise, she was required to store ice-creams strictly at this temperature; the reading stuck with her. When we were handed the menu, the first thing to strike us was the irresistible food photography - Kimi happily gives all the credit to some talented and eager journalism students whose help she enlisted. The menu has all-day breakfast, paninis, soups, salads, pasta and an incredible variety of desserts. We started our meal off with ‘Minus Eighteen’s Nachos’ (Rs. 280). They were served with a drizzle of grated (not melted) cheddar and mozzarella, diced onion, capsicum, tomato, jalapenos and beans. Bringing it all together was the dollop of sour cream and tangy tomato salsa in the centre. The nacho chips were warm and crisp and seemed to be spiced with carom seeds. But the cream and salsa were insufficient lending the dish dry. We then went with Minus’ most popular salad, the Fig and Goat Cheese salad (Rs. 280) – a definitive dish because it was a fusion of different tastes and textures. 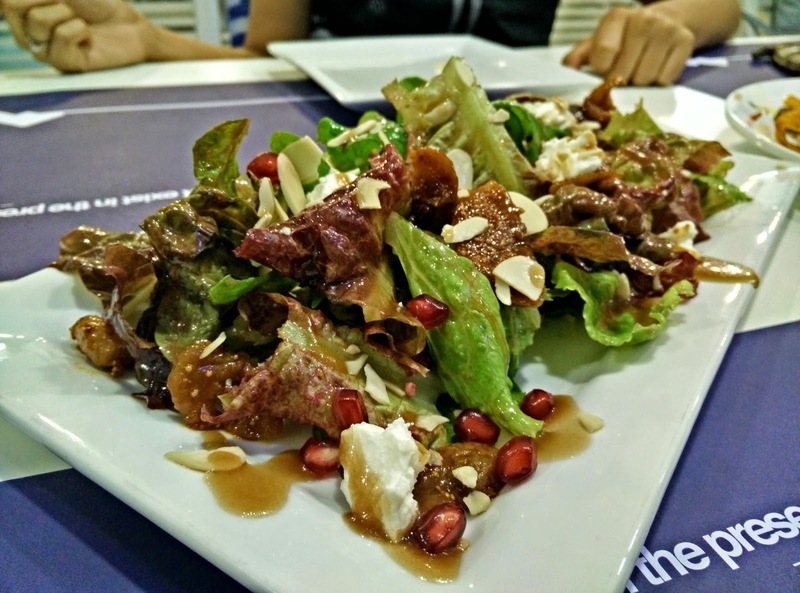 The salad leaves were fresh and glistening with olive oil and vinaigrette; sweetness came from the fig chunks, tartness from the goat cheese crumble, citric notes from pomegranate and crunchiness from roasted almond shavings. For our main course, Kimi recommended we try the Pesto Spaghetti (Rs. 280) and we highly recommend this dish. 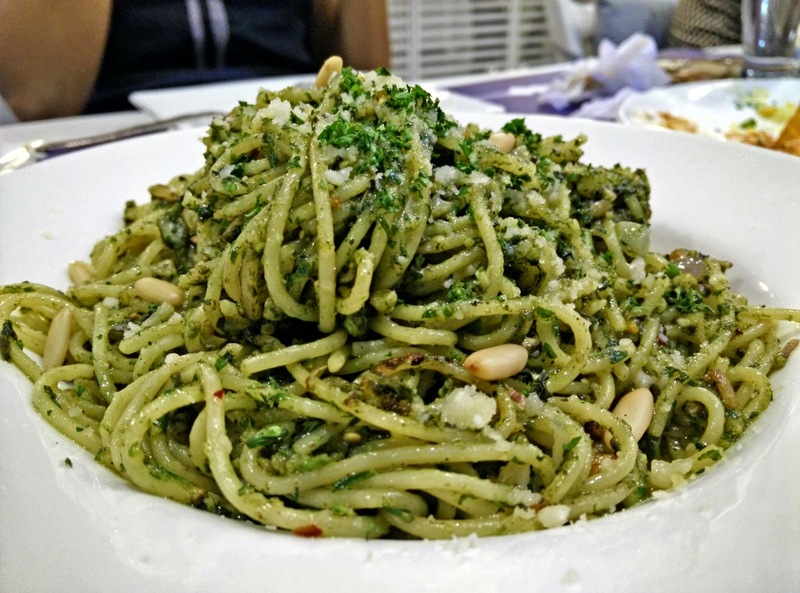 The pesto made using basil, pine nuts, garlic and a lot of olive oil was bursting with fresh herby flavors. The spaghetti cooked al dente combined well with the sauce and was topped with grated parmesan and roasted pine nuts. For desserts, we headed over to the dessert counter. There was so much variety and with bright colors, it would be little exaggeration to say that the counter looked like an edible rainbow. We settled on Lavender Macaroon (Rs. 40), Chocolate Hazelnut Éclairs (Rs. 80) and the Tiramisu (Rs. 140). As attractive as it looked, the macaroon was a disappointment. The sweetness was overpowering and we could hardly detect any hints of lavender. The Éclairs too did not hit the nail. While the chocolate hazelnut ganache was rich and intense with the right consistency, the dessert was pulled down because of the choux pastry – it was ‘bready’ and did not taste fresh. Thankfully the Tiramisu was a winner. Soft, moist ladyfingers intensely flavored with coffee and layered with mascarpone cheese made this a pleasing dessert for the palate. All in all, we are happy to report; our trip across town was so worth it. Minus 18 Degrees is a warm, familial eatery that has something for everyone at all times of the day. This review was also published on The Punekar.